A photograph of a group at the Kansa Indian Agency located in Council Grove, Kansas. Included in the group are back row: fifth from left Irvin Stubbs, ninth from left A. W. Stubbs, and front row seated third from left Mahlon Stubbs and wife, and Mahlon Hockett Newlin and family. Mahlon Stubbs came to Kansas on March 1, 1863 and located on the Kansas Indian Reserve where he served as a missionary, teacher and agent among the Kaw Indians. Mahlon Hockett Newlin moved from Indiana to Council Grove, Kansas to work at the Quaker Mission. The 1870 Federal Census indicates the Stubbs and Newlin families lived in close proximity. 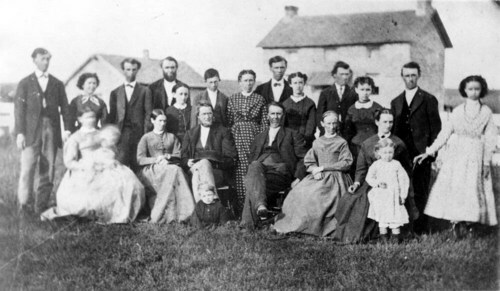 It is possible the other people and children in the photo are members of Joseph Newson's family. They lived near the Newlins and Stubbs, and Joseph Newson was involved in Indian missionary work in Kansas.